Back in May I finally went on my first beach holiday in 3 years. YES THREE. Due to an awful whiplash injury, which wiped me out for almost 2 years, I was seriously lacking that Vitamin D and needed Vitamin Sea! The destination was Cancun, on the beautiful Caribbean coast with 5 of my Queens. 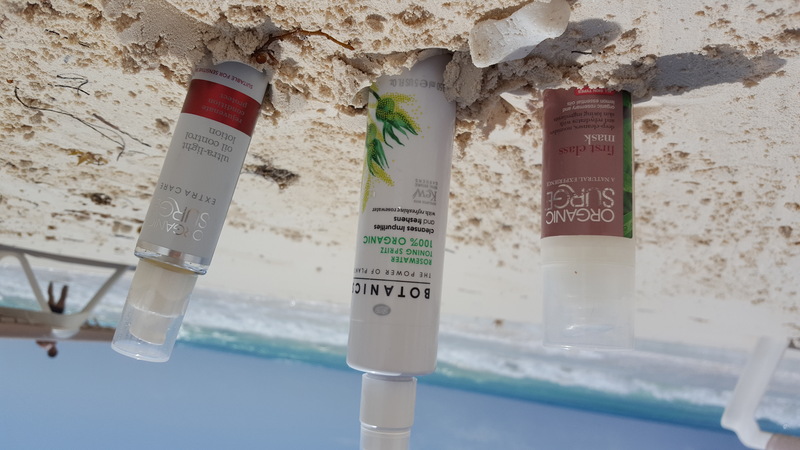 In those last three years I have upped my knowledge on the chemicals and nasties in our beauty products, a couple of years ago I switched to aluminium-free deodorant and for the last 5 years I have used only natural hair products free from parabens and sulphates. Playa Delfines beach. Cancun, Mexico. Due to my highly-sensitive skin I usually alternate between two brands, Elemis and Organic Surge. I’m the girl who can’t fall asleep in her make-up, without having a major breakout the next morning. Due to this I try to avoid any harsh chemicals on my skin, I also understand that our skin is the largest organ our body has and everything we put on it is absorbed into our bloodstream and carried around our bodies. YUCK! Most of you may have heard of Elemis, they are a British brand and staple in many spas and beauty salons across the country and now internationally. The concept of the 25 year-old brand is based on fusing nature, science and aromatherapy. They use ethically sourced powerful marine and plant actives and team it with ‘intricately-blended aromatics’ and skin-science and ground-breaking techniques. Elemis prides themselve on being pioneers within their field. ‘All ELEMIS products are tested by ELEMIS Master and Elite therapists and the results are fed back to the laboratory. This cycle of maturity can take up to three years until each product does exactly what it professes to, achieving real results. That’s why ELEMIS is able to say it delivers pioneering treatments for face and body’. I love the Camomile Cleanser and Apricot Toner set and cannot live without their SOS cream for breakouts. It’s my secret weapon for minimising spots at short notice. Their face masks are also wonderful for an injection of luxury at home, my favourite being the Papaya Enzyme Peel, which smells so delicious and has a thick creamy texture. It exfoliates your skin in the gentlest way which is perfect for sensitive skin. Their Cellular Recovery Skin Bliss Capsules are wonderful little pockets of highly potent anti-oxidant oils which revived skin in the form of two different capsules. Rose for day, Lavender for night and Moringa oil thrown in for delight. These are great to use once back from holiday or even for the flight, when your skin in thirsty and re-adjusting to the pollution and city environment. I know I’m not middle-aged and my collagen is still pretty prevalent but the Pro-Collagen range is fantastic! One of my favourites is the Pro-Collagen Cleansing Balm, which is packed full of oils and waxes such as Lavender, almond, Rose, Mint Leaf, Eucalyptus, Geranium, Elderberry, Orange, Chamomile and anti-aging Padina Pavonica. Your make-up instantly dissolves and it leaves your skin as soft as a baby’s bottom. Actually softer! This was lovely to use some nights after a good few hours in the sun. I have often left this on for a few hours or overnight. (Actually I have done this after a night out and upon waking, with eyes still closed, touched my cheeked and shouted “OMG my skin is sooo soft!” Scaring the life out of my friends LOL). In other words it’s bloody amazing! Organic Surge is a brilliant little British brand, which ranges from skincare to toiletries and baby products. It’s a great alternative to Elemis at affordable prices, if switching from generic skincare brands. I first discovered their line of skincare in Boots, much to my surprise. Eventually the line was discontinued and so I panicked for a while and sadly went back to Nivea, until I realised that I could buy from their website. The brand is 10 years old and prides itself on products ‘NOT tested on animals and are 100% free of harsh chemicals – no parabens, sodium lauryl sulphate, no artificial fragrances or colourants and no genetically modified ingredients. And the very soul of Organic Surge lies in its charitable donations and hands-on work spanning many years’. I am absolutely in love with their luxurious face creams, packed with essential oils and extremely moisturising. The highly-reviewed ‘Overnight Sensation’ night cream contains lavender oil which instantly relaxes you before bed. The ‘Daily Care Refreshing’ face wash is gorgeous, I find useful after the gym after sweating and also having the sauna/steam rooms open your pores and release toxins, it’s reassuring to know that you aren’t just piling back on the toxins by washing chemical-filled products when washing your face. I decided to try their ‘Brightening Hot-Cloth Cleanser’ to take on holiday with me, I have used the Elemis one but wanted to try a cheaper option and give it a chance. (It is AMAZING btw… so thick and creamy, packed with Orange, Geranium and Rose Essential oils). I would give it 10/10. I also decided to try their ‘First Class Face Mask’ and gel eye cream whilst on holiday, which didn’t disappoint either. Rose and its Essential oil seems to be a staple in my skincare routine. My toner ‘100% Organic Rosewater toning spritz’ from Boots’ Botanics range is 100% organic (as you may have guessed) and made from the highly-prized Damask rose. At £5.99 it can feel pricey but it’s free of parabens, tested on people and the bottle is also made from 25% recycled plastic. Whenever I buy the spritz it’s usually on offer, for example there is 1/3rd off Botanics range right now making it £3.99 and it lasts quite a while at 150ml! Last time, I bought two and kept one in my gym bag. I was happily surprised to discover Boots stocked a new range Garnier skincare called ‘SENSITIVE advanced’ with no parabens, colourants or sulphates. It’s also hypoallergenic and their After-Sun is enriched with cold cream, a nourishing agent used since the ancient times which is perfect for hydrating and protecting skin. 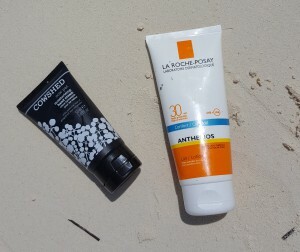 I use SPF 50 generally and although I wouldn’t necessarily put an all-purpose cream on my face, I was happy to see that their after-sun was suitable for face and body. I bought two of each and have been using the after-sun since my return too, it’s really thick and moisturising, smells delicious and keeps your tan golden brown. 1. Coconut oil and hair masks. Shea Moisture Hair Mask was my weapon of choice. I used a hair mask roughly every other day to keep my hair moisturised, especially as it’s prone to getting dry anyway; let alone in immense heat. Sometimes I just used it on the tips or the ends and often used it when slicking my hair up in buns or ponytails. (See my holiday hair post for how I incorporated Coconut Oil and hair masks into my holiday routine). 3. Leave-in conditioner. If you know me, you know that Mixed-Chicks is my go-to product for shampoo and conditioner. This was vital during 10 days in the sun! View more on my hair post. 4. Amazing, moisturising shower gel. 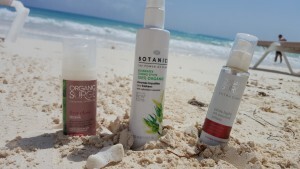 I use vegan-friendly Original Source, I love their ethos and combinations! For this holiday I chose Coconut and Shea Butter, with 100% natural fragrance too- I really felt quite tropical! 5. Face Mask. I usually do quite a few face masks on holiday due to the extreme conditions my skin is under. As much as I try not to get my face in the sun too much, it’s still affected by the heat, sand, sun and chlorine from the pool. I brought along my Organic Surge First Class Mask made with rosemary and lemon organic essential oils. It leaves your skin feeling so refreshed and smells delish! 6. Exfoliating gloves. These were heaven-sent, although best used in the morning rather than evening after a full day in the sun. I made the mistake of using them before going out for dinner and spent the evening very sore! 7. Foot Cream. Our feet on holiday are so exposed, with sandals and beaches, running around barefoot- it makes sense really to bring along your foot cream. I use The Body Shop Peppermint foot cream daily and used it maybe 3 times a day on hols. 8. Lipsyl. You often underestimate how much the sun can affect your body. Lips need SPF protection too. I love Burt’s Bees, it’s natural and smells delicious. My favourite is enriched with Coconut and Pear. Mmmm. 9. Cuticle oil. This is so overlooked but no one wants to ruin their gorgeous holiday nails with awful cuticles. I use OPI Cuticle oil, enriched with avocado oil. 10. A great hand cream. My hand cream was passed amongst the ladies the most I think. I received a Cowshed hand cream called COW PAT in my Birchbox and it was a lifesaver! It was also 50ml so I brought it in my hand luggage. I find sun block too sticky for hands although I use my La Roche Posay on the back of my hands to avoid raisin fingers (and to protect). Although we’re coming into Autumn now, I’m sure there will plenty of you booking sun escapes throughout the colder months. Remember to let me know if you try any of these products and what you think!